Pippa Middleton wows at Wimbledon in £1,200 designer dress | HELLO! Pippa Middleton made a glamorous return to Wimbledon on Monday as she joined her brother James for day one of The Championships. The 32-year-old looked stylish as ever in a £1,200 poppy print dress from Suzannah – a designer loved by both Pippa and her sister the Duchess of Cambridge, née Kate Middleton. The pretty ivory silk dress features a delicate fluted hem and cape detail along with a vintage floral print, creating an elegant look for centre court. Pippa accessorised with a red boxy clutch bag and white heels, and wore her hair down in loose waves. 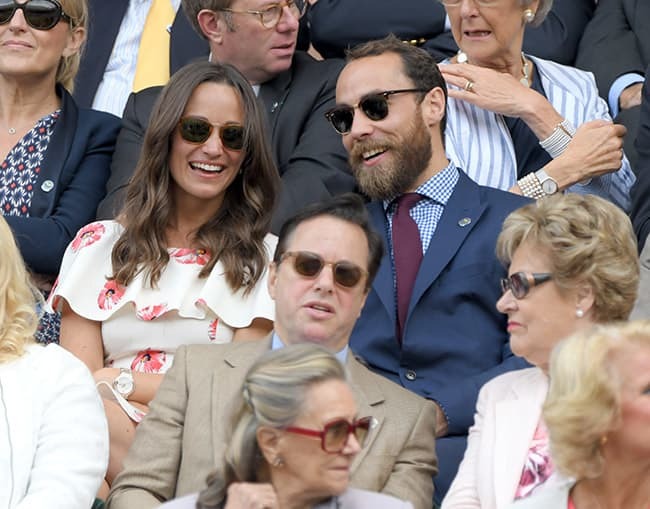 Pippa sat in the royal box at Wimbledon's centre court to watch British player James Ward face world number one Novak Djokovic and appeared to be enjoying her day out as she laughed and joked with her brother and fellow guests. A huge tennis fan, Pippa is often a regular fixture in the royal box throughout the Wimbledon tournament. It is likely that she will continue to make appearances courtside throughout the competition, and royal fans will be hoping to catch a glimpse of her sister Kate, too. In 2015 Kate attended the Wimbledon quarter finals alongside Prince William, just weeks after welcoming her daughter Princess Charlotte. The Duchess is almost certain to attend again in the next two weeks as it has been reported that she may be announced as patron of the All England Lawn Tennis & Croquet Club when the Queen takes a step back following 64 years as patron.